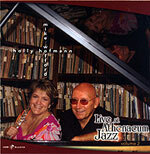 CD review: " Live at Athenaeum Jazz: Vol. 2"
This review first appeared in Turbula in January 2007. While San Diego doesn't have much of a national or global reputation for its music scene, there is some world-class jazz happening in this area. The latest example is the new live album from the husband-wife team of Holly Hofmann and Mike Wofford, recorded at La Jolla's remarkable Athenaeum arts and music library as a follow-up to Wofford's previous set there. Wofford is former pianist for Sarah Vaughan and Ella Fitzgerald, and was the longtime house pianist at the old Elario's jazz club in La Jolla, backing the heavyweights who came in. Hofmann, a flutist, has played with former Basie sideman Frank Wess, as well as fellow San Diegans James Moody and Mundell Lowe. So they're proven world-class talent  and yet, rather than play it safe, this album finds them in the unusual pairing of a piano-jazz duet. In lesser hands, this could have turned out either boring or lacking a fullness of sound. But there's a musical empathy between them (as well, apparently, as the warm acoustics of the room) that gives this outing an absolutely full, rich sound. On both original compositions and covers of jazz standards, Hofmann and Wofford play off each other, trading lead and harmony, using space as much as the notes they play. The result is a straight-ahead jazz album that swings with joy and good humor, but holds enough serious playing to make you want to listen to it over and again.